Today is Election Day – Please Vote! “A man without a vote is a man without protection.” — Lyndon B. Johnson. There are a ton of interesting and important races on the ballot this election cycle. We have one of two U.S. Senate seats up for grabs today, and the winner will head to the U.S. Capitol (pictured above). Meanwhile, in Arkansas, the constitutional offices are closely contested. Governor, Lt. Governor, Attorney General, Secretary of State, and many others have seen tight polling over the last few weeks. Quite a few House seats are close, including one sought by a long-time friend, Jeremy Ross. Many state races, including our local house race between incumbent Richard Womack and challenger Damon Daniels, have turned into a de facto referendum on President Obama's policies — particularly the Affordable Care Act. It will be interesting to see how Arkansas handles Medicaid expansion, since Arkansas is one of few southern states to see a substantial drop in the percentage of uninsured. Here in Clark County, we went from 25% uninsured to 13% uninsured — a 12% drop. That's phenomenal. There are 5 issues on the statewide ballot, and you can see my thoughts on those elections here. Two counties are holding local option elections (links to results for Columbia and Saline Counties) in an attempt to change from dry to wet. If Issue 4 on the statewide ballot passes, the whole state will go wet. That would certainly be in line with what's happened in Arkansas over the past 6 years on a county-by-county basis; however, it would make Arkansas somewhat of an outlier in the South, since most other Southern states have similar wet/dry laws. I wonder if, as it did in 2010, if today's wet weather foreshadows the results of these wet/dry elections? Out in Virginia, Hilary's brother, Brad Martin, is running for a seat on the Virginia Beach City Council. I'll be watching closely as the evening progresses. Here's the link to the Arkansas Secretary of State's website, where voting will be reported once the polls close. Good luck to all the candidates out there. What races have you most interested in this election? I've previously written on the benefit of MRIs taken under real-world conditions, where the patient is sitting or standing upright during the MRI. These types of MRIs are invaluable for explaining why some patients experience certain types of pain patterns, even when recumbent (lying down) MRIs can't always explain pain. I caught a lucky break last weekend when one of my college roommates at the SAE house put his Razorback tickets up on Facebook. He has an infant and won't be making many games this year. We planned on going to Fayetteville for the game, so I stopped in Little Rock and got his tickets. To the delight of my son and I, the tickets were front row south end zone seats. Great seats for a great game. The Hogs capped off a dominating performance against Northern Illinois with a touchdown sprint by Korliss Marshall late in the 4th quarter. This happened right in front of our seats, and my whole family could have reached out and touched the players. 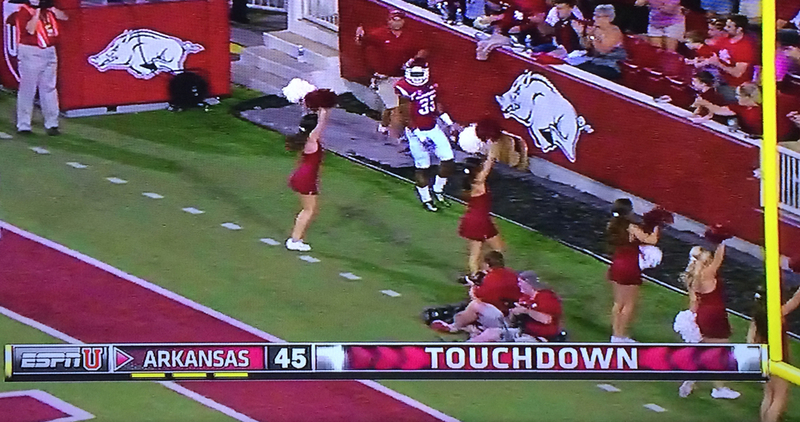 The photo is a screen grab from the ESPNU coverage of the game. Perception versus reality has its place in the courtroom, and juror feedback is a great thing for identifying the difference between the two. I've tried cases in three states in both federal and state court. Every judge does something a little differently about talking to the jury. Many times, juror feedback is limited by the Court. For example, in most federal courts, the judge won't permit any contact with jurors until after any appeals are finalized, and then only if the juror puts his or her name on a list. In state court in Arkansas and Texas, the custom is for the judge to tell jurors that want to discuss the case with the attorneys to leave through the courtroom; other jurors go out a different door. After unfavorable jury verdicts (which any plaintiff's lawyer who tries many cases have had), jurors almost always report that they would have liked to see more information — more medical records, more tax returns, any information about car or health insurance, more witnesses from different parts of life. Courts have limited resources, and so attorneys must make choices about what evidence to present to the jury within a limited time frame. Attorneys for injury victims also can't present any evidence relating to insurance, which is a law we believe should be changed. This is the case even when the defendant has insurance to pay any judgment, or the medical bills actually paid by health insurance are far less than the rate charged by a hospital. So the reality is that people have many more medical records and witnesses than could ever be presented to tell a complete story of a life-changing event. Court rules also limit what types of evidence can be shown to the jury. So, the jury's perception is shaped by constraints on time and by laws created by lobbyists to limit references to insurance and other matters that almost always interest the jury. If you were on a jury, how would you handle the difference between perception and reality? How would you want an attorney to explain the difference to you? A recent opinion piece by a Fox News analyst provides some insight into the cancellation of health insurance policies as the Affordable Care Act (a/k/a Obamacare) goes into effect. He shares our view that pre-ACA, health insurers and their CEOs "made money by finding any excuse, any loophole to deny coverage to the sickest and most vulnerable people in our society." He points out that CEO pay at some of these insurers tops $36 million. We previously reported on how many health insurance company executives make more in a day than most Americans do in a year. You should be blaming your insurance company because they have not been providing you with coverage that meets the minimum basic standards for health care. Let me put it more bluntly: your insurance companies have been taking advantage of you and the Affordable Care Act puts in place consumer protection and tells them to stop abusing people. The government did not “force” insurance companies to cancel their own substandard policies.The insurance companies chose to do that rather than do what is right and bring the policies up to code. This would be like saying the government “forces” chemical companies to dispose of toxic waste safely rather than dumping it in the river. Or the government “forces” people to drive with intact windshields and working brake lights. How dare they “force” drivers to pay money to get those things fixed if they are broken? If you are rushed to the hospital in an ambulance, the ACA says your insurance company has to pay for the ambulance ride. If your son or daughter has a bout with depression or suffers from panic attacks, the ACA says your insurance company needs to pay for their medicine and treatment from a mental health professional. People should be angry that their insurance companies were not paying for these humane, common sense benefits all along. It baffles me that people are directing their anger at the ACA which rights these terrible wrongs. I think it's safe to safe that Fox News is generally regarded as a pro-business, anti-regulation news outlet. So when Fox News is accusing an industry of profiteering on the backs of ordinary Americans, you know they're doing something wrong. When an insurance company decides it doesn't want to pay a claim, it is required by law in most states to give a legitimate reason. If it doesn't give a reasonable explanation or doesn't have a legitimate reason, the insurance company can be liable for bad faith. United Healthcare approved the claim for the sister, but denied the claim for the brother as "not medically necessary." For over a year, the man's health declined, while his sister's improved. As The Today Show prepared to air a segment on the man's fight for life against United Healthcare, the show's producers called to ask for a comment by United Healthcare. The response? A complete change in position, so they wouldn't look quite as bad on national television. Kevin and Katie Dwyer's case shows just how arbitrary insurance companies can be. But most folks aren't going to receive help from The Today Show to make their own insurance company do the right thing. In a country where we are required by law to buy car and health insurance or suffer severe economic penalties, it is unfair that insurance companies get away so often with such arbitrary conduct. Here at the Chaney Law Firm, we see "not medically necessary" claim denials all the time. It is a method insurance companies use to boost profits, often at the expense of their own policyholders. As one example, one car insurance company denied payments for computerized radiographic mensuration analysis (CRMA) services by a medical doctor in Texarkana based upon reports by two chiropractors in Washington State and Georgia. The medical doctor objected to the Washington and Georgia chiropractic boards and the insurance company, but the insurance company wouldn't change its position. That case is ongoing. This example reflects a common practice; in many instances, the insurance company will attach a boilerplate report from a medical reviewer who lives many states away and who does not know the standards of practice here at home. Another example is when insurance companies hire the same experts here in Arkansas repeatedly because they always issue the same boilerplate reports in favor of the insurance company. You can read more about these so-called "medical reviewers" and their predictable opinions on our professional defense witnesses page. If you've been told by an insurance company that a treatment is not medically necessary, you have rights. You can appeal the insurance company's decision, take your case to the Insurance Commissioner for help, or hire an attorney to help you with the process. We provide free consultations and would be happy to see if we can help.